Info "Assemble the car parts. Use your fingers and your brain to do this." 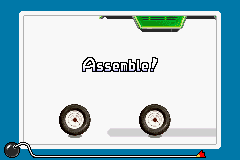 Assembly Line is a microgame found in the Reality folder in WarioWare, Inc.: Mega Microgame$!. The objective of the game is to guide the body of the car so it will fall correctly onto the wheels. 1st level difficulty: The player must assemble a green jeep. Its tires are very big. 2nd level difficulty: The player must assemble a blue car. Its tires are smaller than the jeep's tires. 3rd level difficulty: The player must assemble a white van. Its tires are very small. This page was last edited on September 19, 2018, at 19:15.